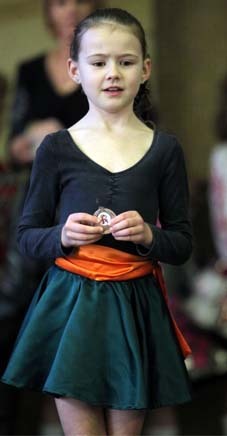 There is a great deal of discussion around what an Irish Dancer wears. But to begin with, simple is good. You need the basics for your first competition which is soft shoes and a simple skirt and top for girls and black trousers and a shirt for boys. In fact, as a beginner you aren't allowed to wear the dresses worn by Open level dancers. 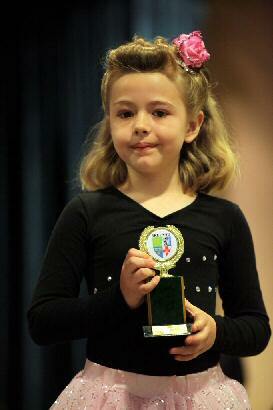 Beginners - All dancers in beginner grade may only wear a team costume or skirt and top/leotard. In Primary grade wigs are allowed - but not makeup under 12. A nice easy look for beginners is to put her hair in a bun, you can put a scrunchie around it that matches her skirt. She will have the shoes from class, but may not yet have competition socks which are bubbled weave socks. To make the skirt and top a little more Irish- looking you can add a triangle shawl at the back. Pin it at the left shoulder and right hip. This is a dress rather than skirt and top. It has ruffles at the hem. Later on you may wish to hire a dress from your school for an annual fee or buy a used dress. You may have seen very elaborate dresses on other girls. Remember, they are are not allowed to be worn by beginners. Only simple dresses can be used in Beginners. When your daughter gets into Primary grades she can buy a dress. Used dresses can be resold and buyers can be found when your child outgrows it. Try looking at www.dance-again.com there are hundreds of dresses there. A site from the US is www.irishdancingexchange and a WA site called GetThat Dress. ( Print off images to show the teacher the dress you're interested in). Don't forget the bloomers ... bloomers which match the underskirt colour are worn when dancing. Many mothers buy smocks for the children to wear over the dress as they may be wearing it for a few hours. Food is almost always on sale at competitions and the smocks cut down on dry-cleaning bills. Beginners cannot wear wigs. Curls are not compulsory! Your daughter can wear her hair straight but except for those lucky girls with naturally curly hair, the hair is curled with curlers or rags etc. The Hair can be done `half up half down’ with a matching scrunchie or ribbon around the top pony tail. There is also a trend to having the hair up. This is often used when your daughter's hair is too short to curl tightly and ends up with a woolly ball for a hair do. The hair can be scraped up to a bun but left curly, not combed. Often this style is worn with a small tiara. But check with your teacher before you rush out and buy a tiara for a beginner. Also there is a rule that says you can't wear prizes (sashes, medals or tiaras) so check that your head gear isn't going to upset anyone. Curled hair is set with setting mousse so that the curls will hold for 3 hours of dancing. Any mousse will do if it mentions "strong hold" on the label. If your daughter has fine hair use small rollers, thick hair use the larger rollers. Curling papers can be bought by the box from hairdressers and these will help protect the hair while it’s curled. If your daughter can't sleep in rollers, try "Softspikes" available by mail order from California. You can order online Softspikes! You can sometimes buy these from traders at competitions. Boys wear good dark trousers, not too loose, so as not to disguise the leg movements, and with a bit of stretch to them for ease of movement. White or coloured long sleeve collared shirt, with a bit of fullness. Tie/bowtie - check with your teacher (some have a preference for one or the other, or prefer no tie). Maybe a vest with celtic motif - to stand out from the crowd. Some boys wear celtic belts (like cummerbunds) instead of vests. The boys have an advantage in smaller local comps in that they are unusual enough to be noticed anyway. You will also see some boys in kilts and blazers. Boys' Shoes - soft shoes like boys jazz shoes - lace up, with small heel. Boys wear soft shoes with a heel so that they can click together like hard shoe dancing. Why Irish dancing for your sons? The competitions appeal to a boys sense of competitiveness, and they all seem to gain an incredible amout of self confidence as they master the dances, and perform in front of groups of people. 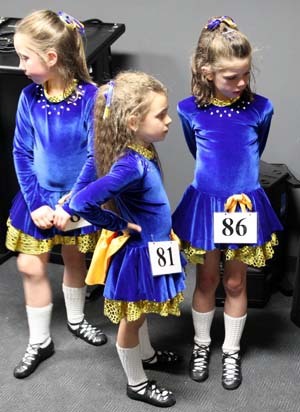 Irish dancing is excellent for leg strength, fitness and coordination. (and of course they get to meet and dance with a multitude of pretty and talented girls!! - this may appeal to the slightly older boy) Seriously though, for the boys working with the girls in the teams and individual dances they gain a great deal of respect for each other abilities and talents. Dancing is hard work (like footy training), requires a great deal of discipline to succeed (like the martial arts)and practice - like any sport or musical endeavour. Once the boys start working in team dances, Team spirit is very much in evidence (as much as any 'traditional' boys sport). 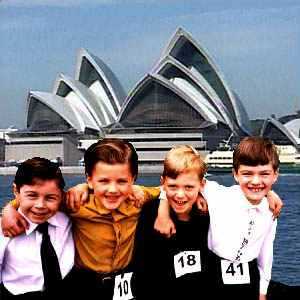 For the boys involved in dancing, they need to have a strength of character (or guts) to do something that is not quite traditional in the Australian psyche.